Yes Skiers & Riders, you are reading correct. This offer valid at the Hotel Tres Puntas or the Hotel Puerta del Sol. 2nd person free is also available for 3 or 4 night stays during this time period. June 24 to July 1: 7-night package from Friday to Friday. June 27 to July 1: 4-night package from Monday to Friday. June 28-July 1: 3-night package from Tuesday to Friday. · This promotional deal is not applicable to youth/child rates. · Offer valid for U.S. and Canadian residents. · Reservations must be booked before May 16. · Offer valid in Hotel Puerta del Sol and Tres Puntas hotels. · Offer cannot be combined with other offers or discounts. · Offer dependent upon availability. 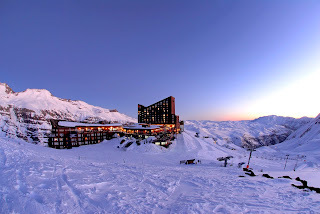 Call a Valle Nevado Ski or Ride Specialist NOW @ 888-754-2167 for more details on this amazing offer or click on this link to build your own 50% off package.